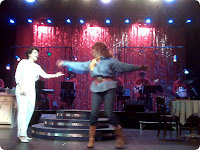 “Always…Patsy Cline” is a play about the real life friendship between the show's namesake and Houston housewife Louise Seger. 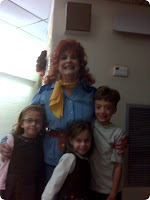 Glenda, Cindy's Mom, co-starred as Louise. We took Alex to see the last show, today. And it was great. Glenda completely rocked the house. That is her with the very big wig, in the picture. The singing by the girl playing Patsy was incredible. (She is on the left in the picture.) And the live band (in the very back of the photo) completed the effect. It was such a good show that our kids loved it, too. 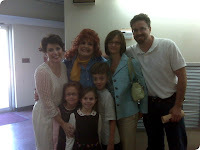 Afterward, we went backstage and huge out with the cast for a bit. Took some pictures with the stars of the show. Let them know how much we enjoyed it and listened to the producer tell about the time he met the real Louise Seger. Absolutely wonderful show. The first time I'd seen Glenda play a lead role. And I hope it isn't the last. Great way to end the weekend.